Our good friend, Joshua Berrios of Drummer's Corner Group, spent some time with a Compact Nesting Kit, Bronze Snare, and a Plied Maple Snare. Here is his review on these drums. SUPER THANKS to Joshua for checking out TreeHouse! The kit arrived yesterday afternoon and I was able to take it to practice last night. It’s awesome! My band mates approve too, and that’s not an easy sell! Thanks again for making me this beauty. I spent several hours behind this beauty over the last two days and I gotta tell you, this kit blew me away. So warm, so beautiful, and so articulate. Didn’t matter if I was playing softly or laying in to them, they never ceased to sound amazing! Your shop does amazing work. I tried to stick them in my cases but the guys at PSU weren’t having any of that! 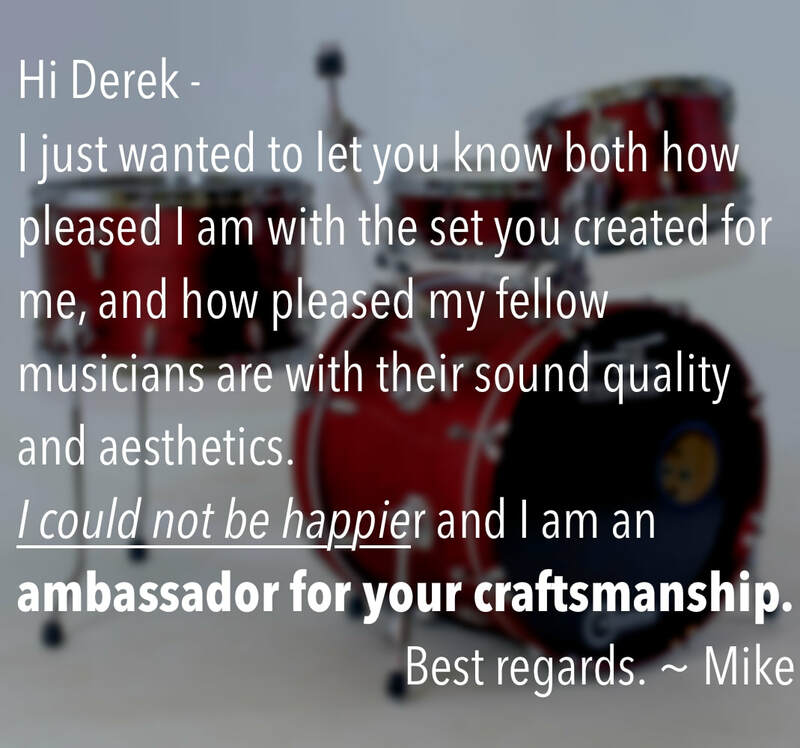 Hi Derek - I just wanted to let you know both how pleased I am with the set you created for me, and how pleased my fellow musicians are with their sound quality and aesthetics. I could not be happier and I am an ambassador for your craftsmanship. Best regards. I love the "family" feel of the brand. It's local and very easy to have my needs met. Derek, Jason, & the whole team do a fantastic job. Plus the drums sound incredible! Thank you ever so much. 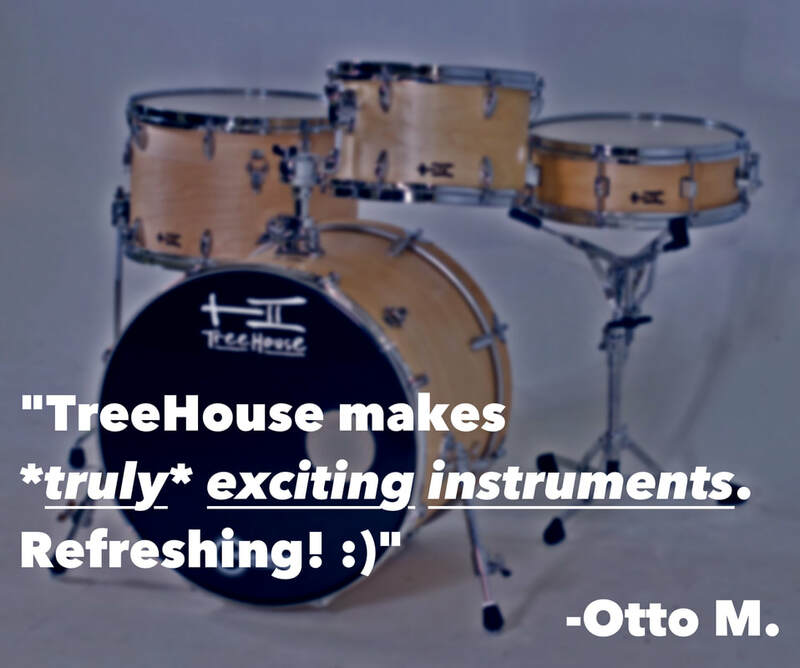 TreeHouse makes *truly* exciting instruments. Refreshing. I just spent the last two days with those drums in the studio, and it was amazing! They sound so good-the toms and bass drum were huge and clear. Reminds me of some of my favorite Joe Morello recordings. The snare is my new favorite. It's absolutely fantastic. It was a joy to use in comping and solos, but a great back beat too! Thanks again for all that you do! Thanks a lot TreeHouse. I can't wait to get this drum in the studio; the video sounds great. I'm a big fan of your drums, and I love the way your guys do business. "I like these drums so much they changed my personality." I am enjoying my TreeHouse "purpleheartlike" nesting kit. It is getting hard to find a reason to use my huge kit when I can haul this in one trip. A recent example proving the point was when Big Rick Soul Band had two gigs with only one hour to tear down, drive and set up at the second location. 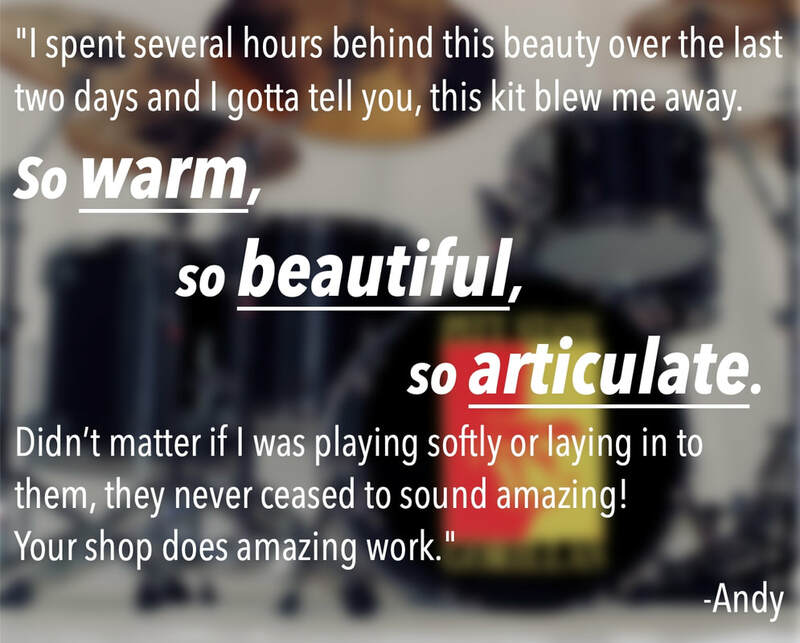 I couldn't have done it without this amazing kit." 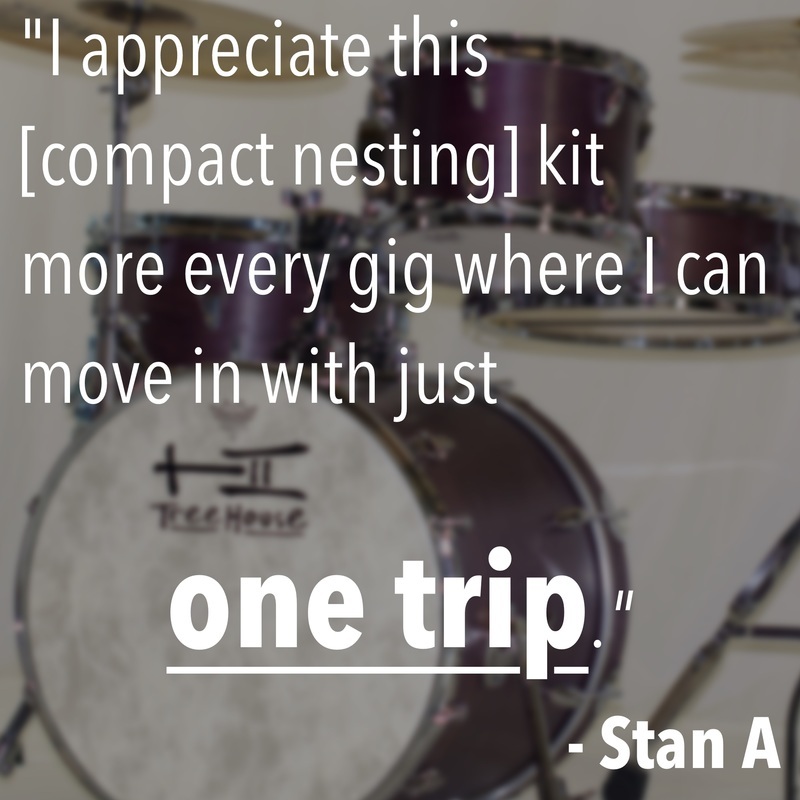 ​"I appreciate this [compact nesting] kit more every gig where I can move in with just one trip. "Simply gorgeous! TreeHouse deserves every ounce of recognition it receives! A fantastic product Hand Made right here in the USA! Beautiful work Derek!" 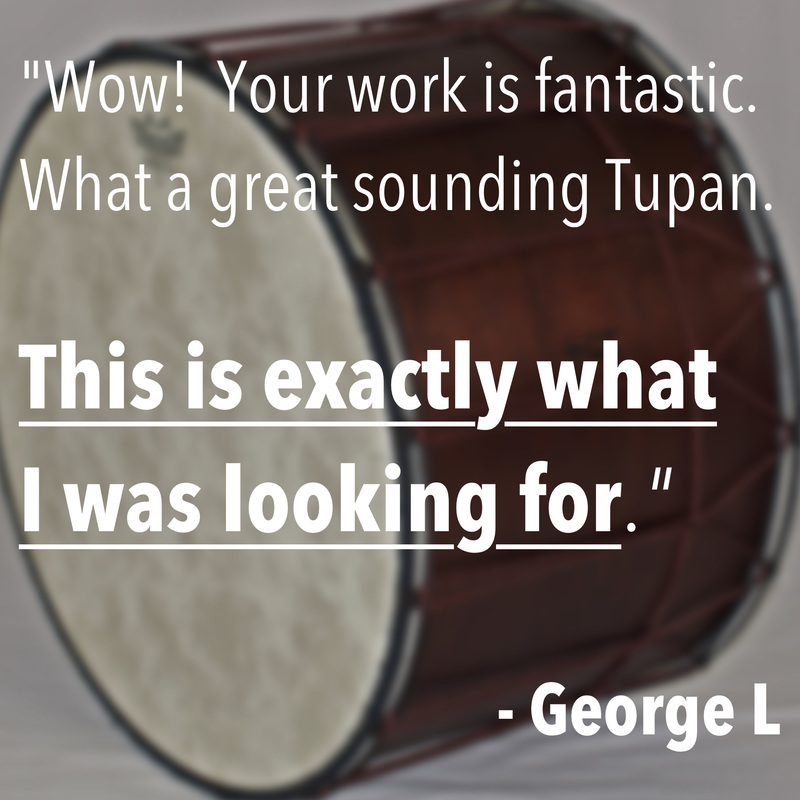 "This [tupan] is a FUN drum to play in an middle eastern ensemble because it adds such a powerful voice to the mix." I got the concert toms set up. Wow, very nice, my friend. I have had [insert four major name brands here] concert toms - yours are the best I have ever heard. Really impressed." 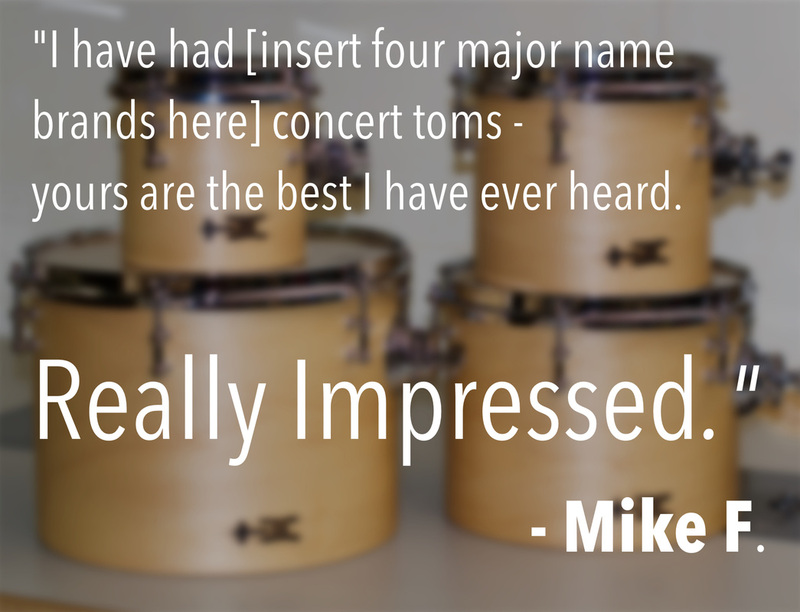 "I just put together this TreeHouse [Compact Nesting Kit] Drumset and it is freakin' amazing. It is UN - BELIEVEABLE, Jason! This is just so fantastic. I am just beside myself. You guys are freakin' amazing." "It took me less than 5 minutes to break down the entire [compact] kit and put them into cases. Unbelievable!" I have done an initial tuning of my TreeHouse kit and they already sound great! The 9x10 tom has more resonance and depth than I thought possible. The 13x13 floor tom, similarly, has lots of presence. Beautiful. The bass drum, despite its shallow depth, has a sonority and dynamic variety that is pleasing. I can't wait to try different snare tunings-doesn't sound like a piccolo. These are impressive drums already! 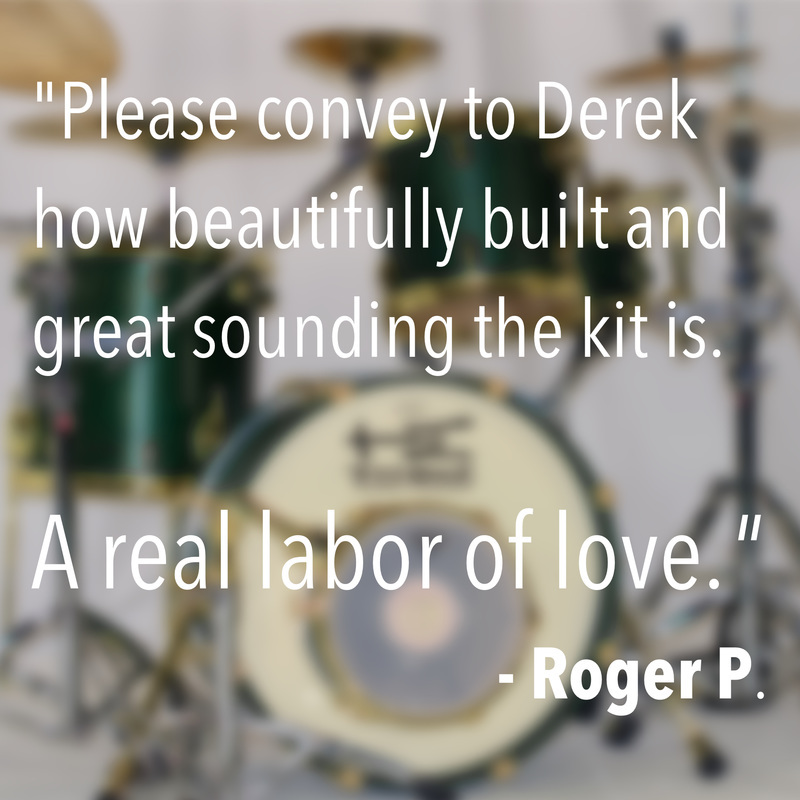 Please convey to Derek how beautifully built and great sounding the kit is. A real labor of love." 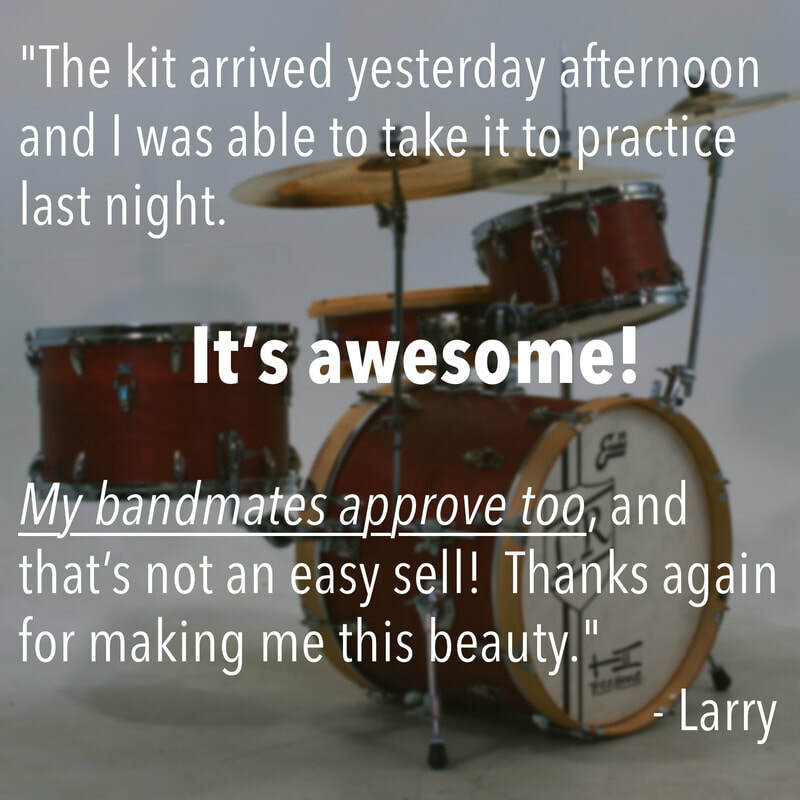 "Excellent kit, as always. One really needs to know how to convey class and style when presenting a finished product, especially with drums. 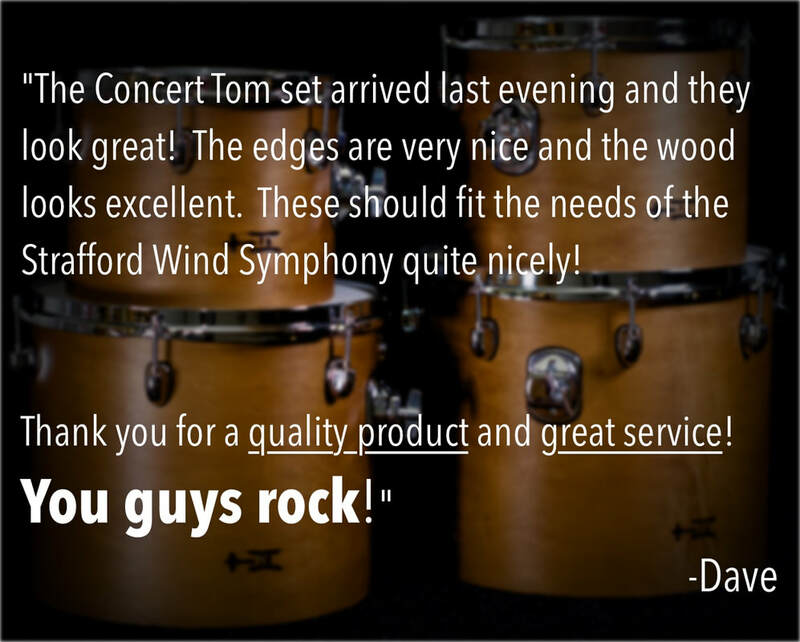 You guys do it over and over again with seemingly modest components that make up for awesome drum kits through thoughtful and appropriate application (speaking style-wise) All in all - another awesome job by TreeHouse drums." These drums are so amazing. I have yet to tune or change the heads. The just hold the tune so well off the trucks. It's really impressive." 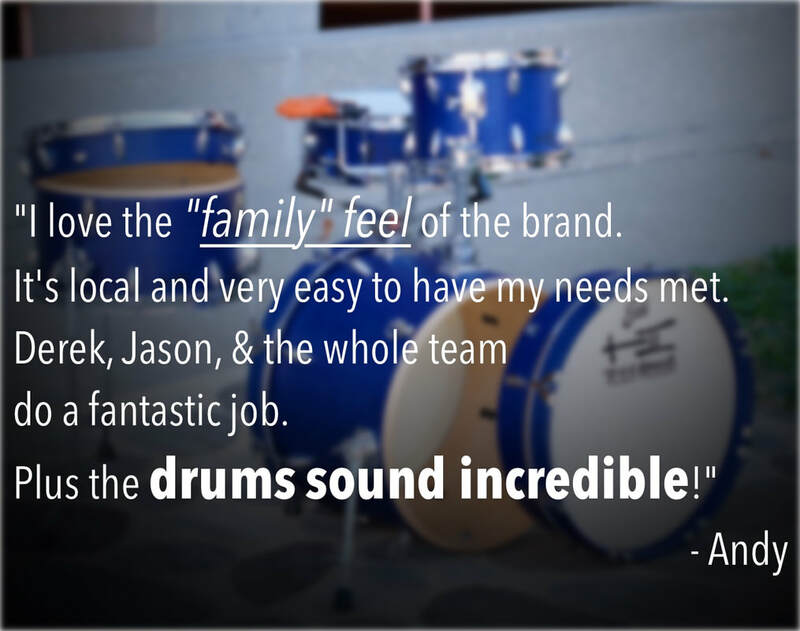 "The kit sounds great! You really nailed what I was going for on the toms! I look forward to lots of fun times with these! Thank you for everything!" 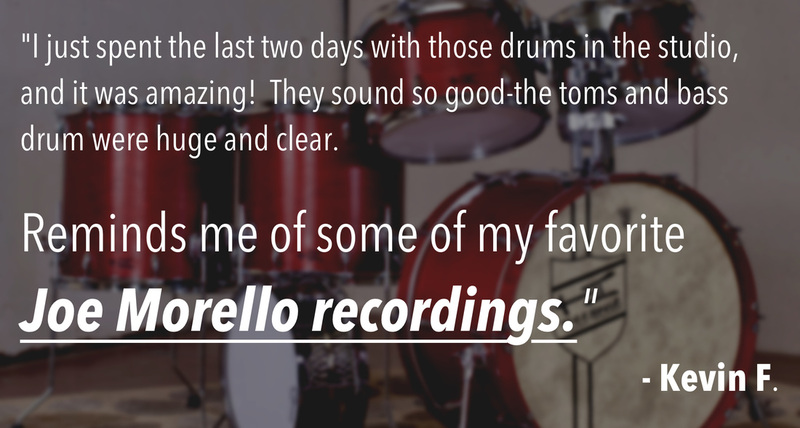 "The drums sound GREAT! I absolutely love them. Warm, punchy, and versatile. Couldn't ask for anything better." "The craftmanship is really second to none! 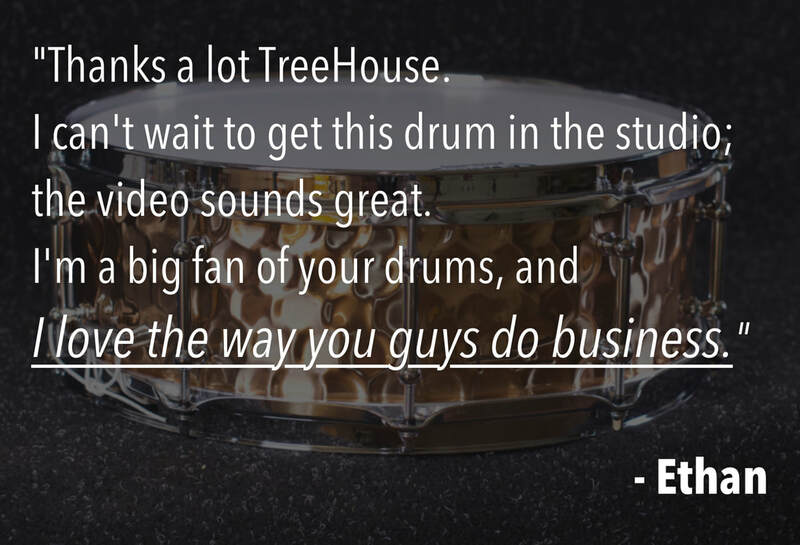 These drums sound amazing and you can see that TreeHouse really puts their heart and soul into each drum they create. Plus, these are some of the nicest guys to work with!!! 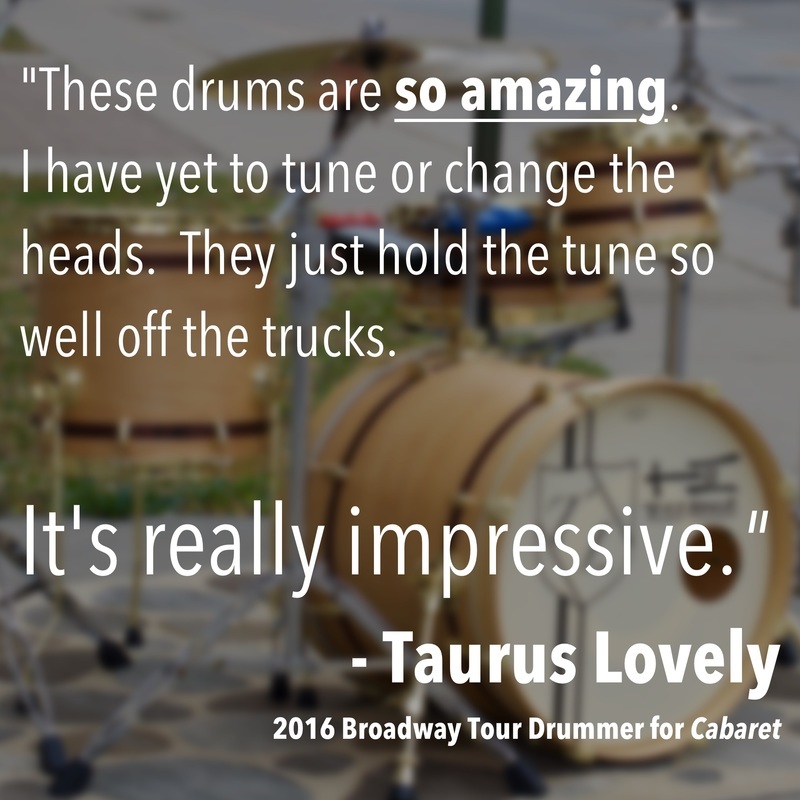 In short, I love absolutely everything about these drums!" I just received your Tupan. Wow! Your work is fantastic. What a great sounding Tupan. This is exactly what I was looking for. Love it. Thank you so much for crafting this drum for me. This is probably the best drum that I have ever owned so far. I will spread out the word for your company to my students and friends." The Concert Tom set arrived last evening and they look great! The edges are very nice and the wood looks excellent. These should fit the needs of the Strafford Wind Symphony quite nicely! Thank you for a quality product and great service! You guys rock!" It's been a while since we've talked. I played a gig last night with my TreeHouse [Compact Nesting] Drums and couldn't have been more pleased with the sound and setup/teardown of the kit. During the gig I just kept thinking how much I appreciated your instruments as well as your generosity. Thanks a million. 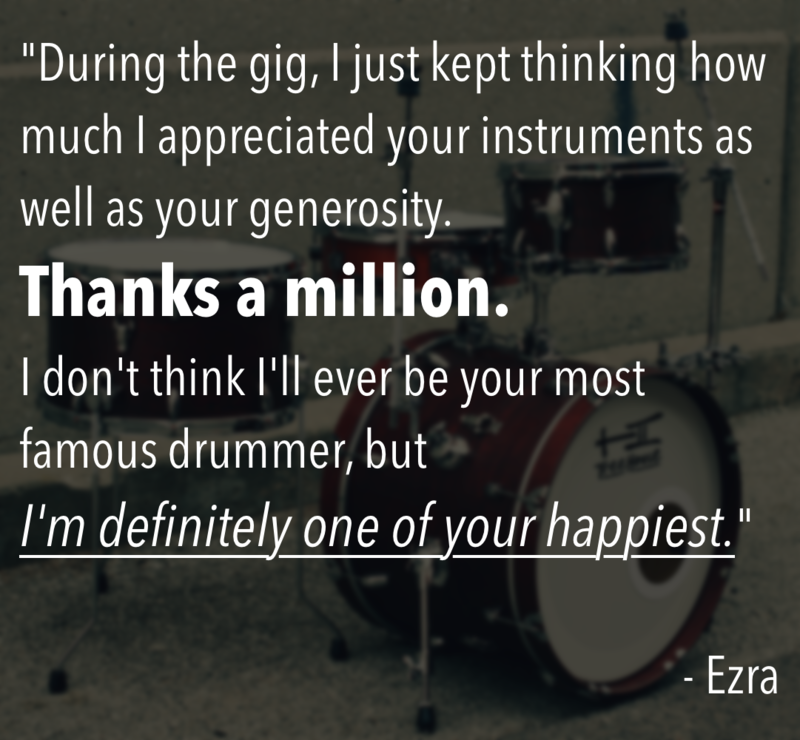 I don't think I'll ever be your most famous drummer, but I'm definitely one of your happiest."